Here’s the formula for a splendidly simple DIY monitor/woofer speaker system designed to work with the S.E.X. amp. Total cost is less than $500! We don’t sell any of these parts, but we have listed sources for each component. This should make a killer dorm room or office speaker setup, and it should work great in that first apartment, too. The small pre-finished cabinets and pretty Fostex drivers have a very high WAF, too. Assembly is pretty self-evident. You will need to cut holes in the front baffles to mount the drivers, using the template provided with the drivers. We used an adjustable fly cutter that we got from Home Depot on a 1-1/2 HP floor standing drill press, and just centered the holes on the baffles. If you don’t have that kind of equipment, maybe you can cut a round enough hole with a saber saw??? We’ll leave any alternative hole making approaches up to you! Stuff each cabinet with about 1/8 lb. of the Acousta-stuff. 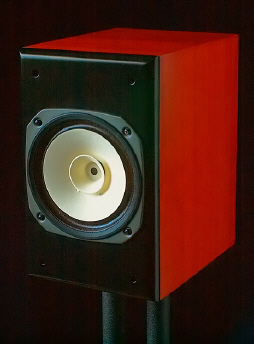 Install the binding posts and wire the speaker terminals to them – red to + and black to -, with your favorite flavor of wire. You may want to solder the connections, or one could install crimp-on quick connectors. Use long enough wires to make it easy to connect the wires with the drivers sitting outside the box. Mount the drivers and their gaskets, and the monitors are done! The woofers we originally spec’d are a pair (yes, you must use two because of the high 125Hz crossover frequency) of Parts Express subwoofers. However you may use whatever generic active subwoofers you prefer. Just be sure what you get can be set to a 125Hz or so crossover frequency. We call them woofers rather than subwoofers in this case precisely because they are running up so high. The Dayton subs mentioned here were chosen on the basis of cost, and because you will be ordering a most of the rest of the project from PE (man, they should give us a commission!). They are down firing subs. In theory a front firing sub will integrate better – and typically cost more. Woofers – Dayton 10″ 125W active subwoofer – Parts Express – you will need TWO. Run the signal from your CD player/sound card/Ipod/whatever into your S.E.X. amp with interconnects. Connect speaker cables from the speaker output binding posts on the S.E.X. amp to the left and right monitors. Then run more speaker cables from the binding posts on the monitors to the input binding posts on the corresponding subwoofer, with the woofer connections reversed (red post on monitor to black post on woofer, black post on monitor to red post on woofer). Connecting the system this way will avoid running the signal through a 125Hz filter that’s built into the monitor output of the subwoofer. That filter would interfere with the designed roll off of the monitors and mess up their bass response. Keep the woofers close to the monitors. They are running up to 125Hz and at that range you can definitely localize where the sound is coming from. Aligning the monitors so they are directly over the woofers will probably give the best integration of midrange-to-bass. Try to set the monitor height so that the center of the Fostex driver is close to level with your ear when seated. The Fostex drivers are very directional, and you may find that the the highs will sound best with the speakers aimed directly at you. They will also squawk until they break in! Be patient, they do tone down with use. Start with the woofer crossover frequency set to about 125Hz, the output turned all the way down, and the phase set to 0 degrees. While playing music bring the woofer gain up slowly until it sounds balanced with the midrange emanating from the monitor. There may be a slight “hole” in the lower midrange. Fiddling with the phase switch (or knob) may help. Be careful to set the phase the same way on both woofers, or your bass may disappear! A great way to get the system to sound more balanced is to incorporate a baffle step correction filter (BSC), which compensates for the lower midrange/upper bass rolloff which occurs due to the narrow baffle width of the monitor cabinet. The 0.0012uF is optional and provides the treble boost if your room and taste calls for it. You can go up to twice that value if more treble is desired.